If you like dressing in a classic and fun way, you will definitely need an overcoat for men in your closet. This coat is versatile and gives you that refined look. Almost as good as a pullover. In this short guide, we will look at how to wear a camel overcoat for men in a casual and fun manner. As always, there will be links below for you to shop the look from some of the world’s top retailers. 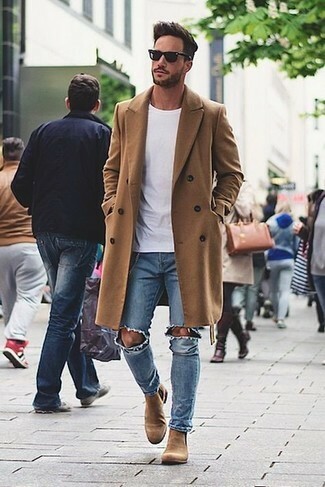 Wearing a camel overcoat with a crew-neck tee is a super smart move that will make you stand out. Due to the color of the overcoat, we advise you stick to just three colors so you don’t come out looking funny. The three colors are white crew-neck t-shirt, the grey, and the black. Pair your camel overcoat on a navy blue jeans for a standout performer and a serious look. A pair of leather dark brown work boots will relax the mood a little bit so you don’t come on too strong. The alternative is for you to team up your tan overcoat with ripped jeans. We love the blue ripped jeans for that nine to five feeling. For the footwear, when in doubt – go with Tan Suede Chelsea Boots. They always look so cool with ripped jeans. 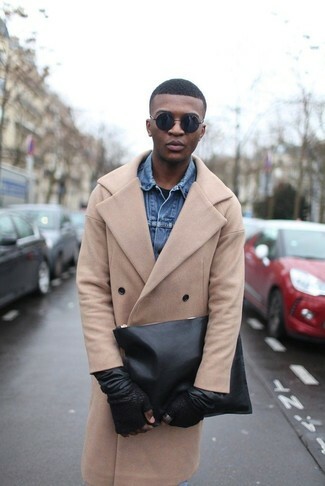 The third look from us on how to wear your camel overcoat with a white crew-neck involves mixing it up a little bit. Get your camel overcoat layered above the white crew-neck tee with black slim jeans for that weekend getaway look. Dress it down a bit with a stylish white low top sneakers that screams “I’m super cool”. 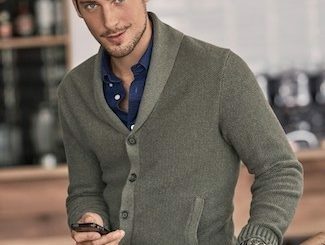 Now that you’ve mastered how to style a camel overcoat with a white crew-neck t-shirt, how do you wear a camel overcoat with a grey crew-neck t-shirt? Look cool and classy in a camel overcoat by pairing it with navy jeans and a pair of brown leather brogue boots. The boots could be dark brown or tan. The focus here with this style is to look classy and still casual. 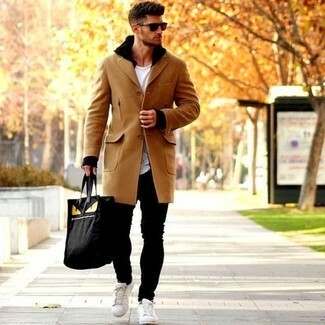 Another way to style your camel overcoat with a grey crew-neck t-shirt is by combining it with a pair of grey running jogger pants and black leather low top sneakers. Who says you can’t look athletic and smooth? 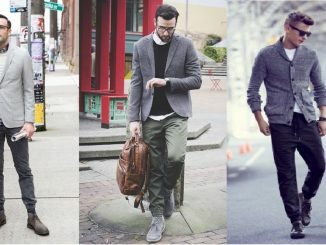 Choose a tan overcoat with grey running pants but with a pair of white leather low top sneakers. The white sneakers add a new dimension to your look. It’s cooler than the black leather sneakers that we had in Style #2. Our third look is on how to wear a camel overcoat with a black crew-neck t-shirt. 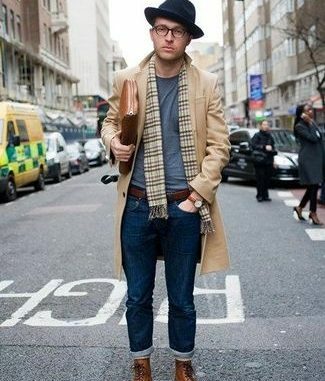 Pair your khaki overcoat with light blue skinny jeans for that early morning rush to work. This is one option and for footwear, go with white low top sneakers for that dazzling look. 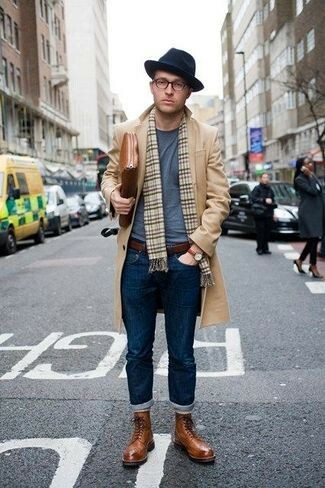 You can also go simple and smooth by teeing up your overcoat layered above a blue denim jacket for that standout look. Not sure if you feel like standing out or blending in? Go with a tan overcoat with a classy jeans trousers – make it black. This is classy but not formal enough, so it’s well suited for outings with friends. For footwear, a pair of black suede casual boots is perfect.